Though I shouldn’t be, I’m frequently surprised by people that have never eaten homemade sauerkraut. Why shouldn’t I be surprised? Until a few years ago, I was one of those people. Since Ky and I learned to make our own kraut (from only two ingredients!!!) I can’t go back - it’s far better than anything from a jar and mostly just requires patience. Like making beer, sauerkraut is the result of fermentation. The process is actually quite amazing when you consider that you only need two ingredients: cabbage and salt. Well…that’s not totally accurate, because you also need bacteria. Fortunately the bacteria you need occur naturally on cabbage leaves. You don’t have to add them because they’re already there. When you chop cabbage up you create surface area for this bacteria for flourish. Under normal conditions this would just cause the cabbage to rot. When you add salt to the mix, water is pulled from the cabbage leaves. This allows you to let the bacteria, specifically lactobaccillus, to work anaerobically (not exposed to air) by submerging it. When the cabbage is submerged, lactobacillus begins converting sugar in the cabbage to lactic acid. This is what gives sauerkraut its sharp taste. It’s also a preservative. Lactic acid protects the cabbage by preventing other, potentially harmful bacterial from gaining a foothold. Let’s talk about what you’ll need and how to do it. The Mason Tops fermentation kit is not necessary but contains some really handy stuff for fermenting all sorts of vegetables. At left, a wooden tamper. The purple and red disks are air-locking covers, and the clear disks are weights. First, you need some equipment. Don’t worry - this is a very, very simple list to fulfill. If you’re really hard-up you can do every bit of this with common kitchen equipment and some creativity. Large mixing bowl. Stainless steel is preferred. I’ve also used large cooking pots for really big batches. Fermenting vessel, i.e. a Mason jar. A cover for your fermenting vessel. This can be as simple as some cheese cloth or a paper towel, however, Ky and I really like the covers included in the Mason Tops kit. 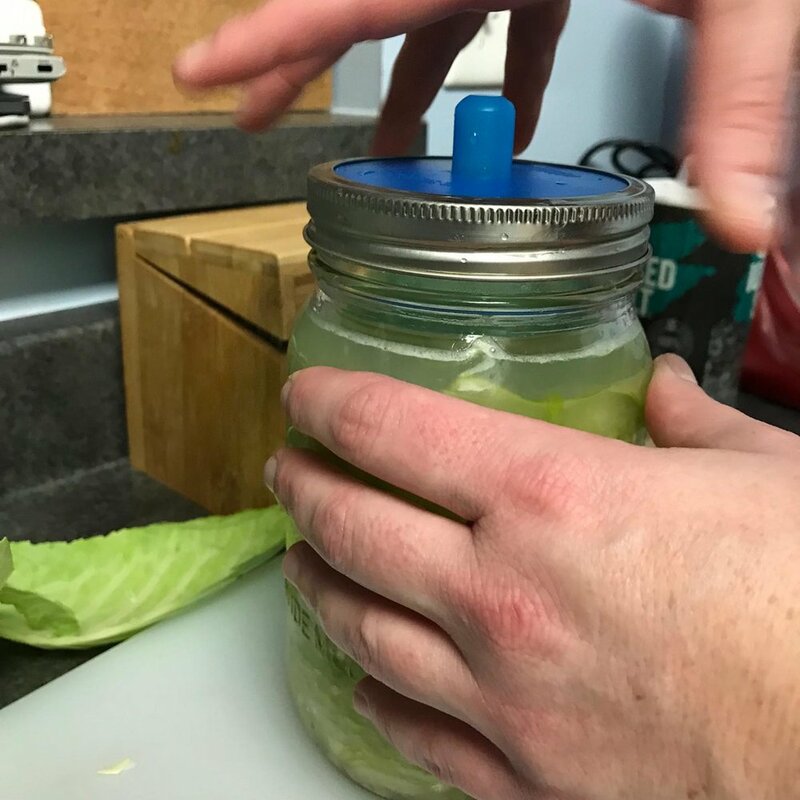 A weight to keep the cabbage submerged in liquid. Again, this can be as simple as a clean stone, or you can use a purpose-built weight, like the one in the Mason Tops kit. Cabbage. As Rich and I stressed in our cooking episode, the better your ingredients are, the better your finished product will be. Buy the freshest cabbage you can find. The fermenting vessel is the least obvious of these, but it’s not hard to find something that will work. 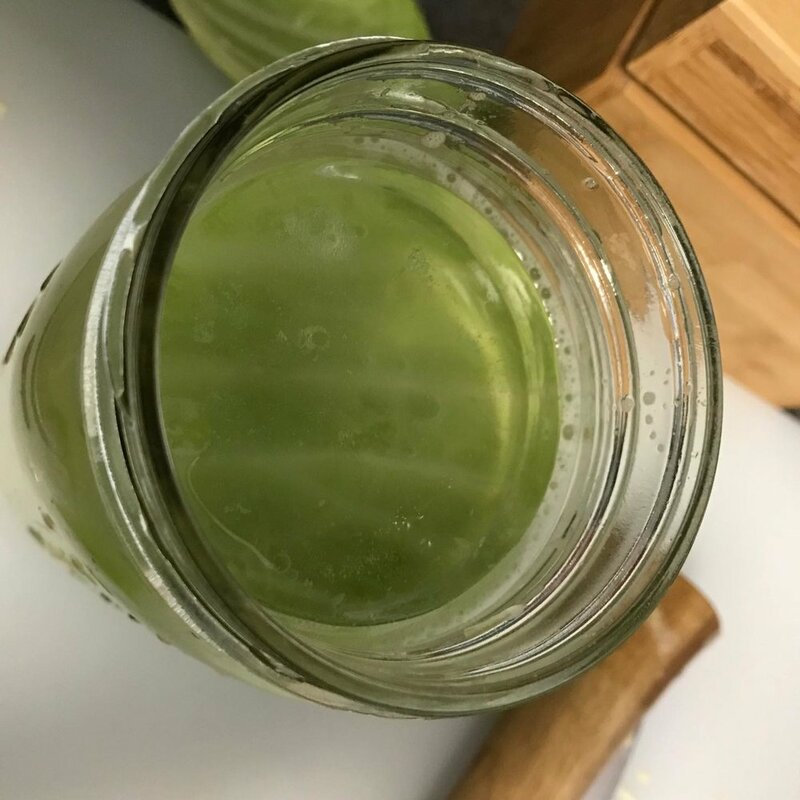 For small batches (one head of cabbage) a 1-quart Mason jar will work just fine. There are definitely specialized vessels but all you really need is something that is deeper than it is wide, and that you can get utensils down into (and kraut out of). You’ll also need some sort of weight, but I’ll address that one a little further down in the process. Once you’ve assembled your equipment and ingredients, chop up that cabbage. Before you begin, remove one large, clean outer leaf and save it for later. We like ours chopped very fine. Having a very sharp knife will help with this. Chop the entire head, minus the core and the outer leaf I told you to reserve, and put it in your mixing bowl. Add in 1 tablespoon of salt. Once you’ve added the salt it’s time to get your hands dirty. Actually, get them clean first (wash your damn hands, hippie! ), then sink them into that bowl of shredded cabbage. Knead the cabbage between your fingers. make sure to get to all of the cabbage to get the salt mixed in thoroughly. 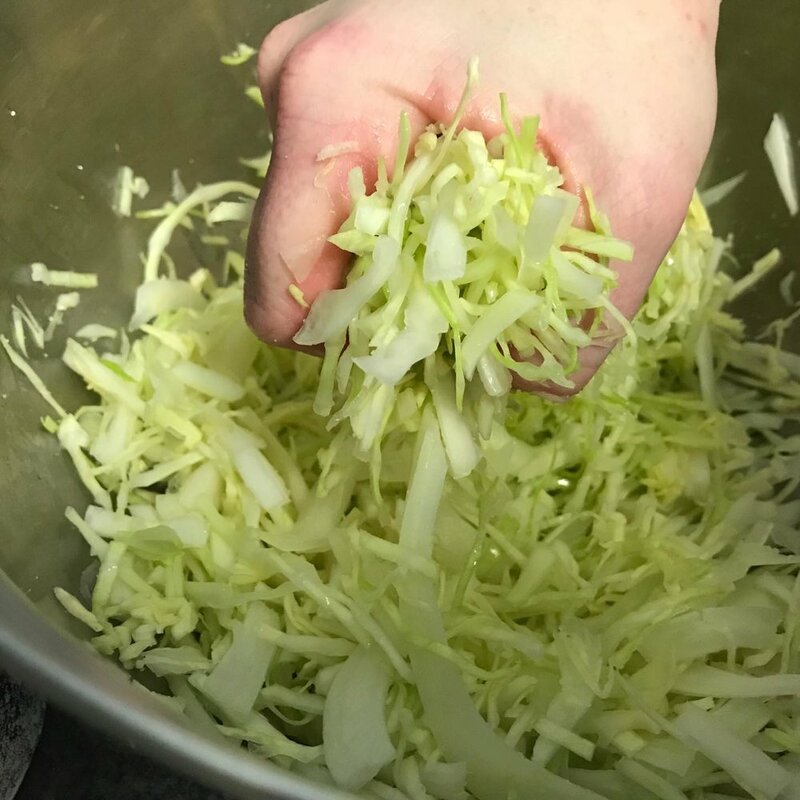 As you knead, crush the cabbage in your hands. Not only is this a good grip-strength exercise, it also bruises the cabbage. Bruising is an important step as it allows the right bacteria to get to work more quickly. This process will probably take 10 to 15 minutes. If your cabbage is right out of the fridge it will also freeze your hands. We like to let ours come to room temperature before chopping for this reason. You will notice that the salt begins pulling water out of the cabbage. Preserve that liquid; you will need it. The next step is to put the cabbage and liquid into your fermenting vessel. This is probably the most critical portion of the process. Spoon the kraut into your vessel. After you’ve added a scoop or two, tamp it down firmly. Add more and repeat. You want the cabbage pressed tightly into your vessel as possible. Repeat this process until all the cabbage is in the jar and tightly packed. If any liquid remains in the bowl, pour it in, too. For fermentation to occur, all of the cabbage must be submerged in the liquid. Anything that is exposed to air is a vector for mold, which can infect the entire jar and ruin it. This isn’t as big a problem as it sounds like; I’ve made dozens of jars of homemade sauerkraut and I’ve never lost one to mold. To hold the cabbage under the liquid you will need some sort of weight. This is also where the leaf I mentioned earlier comes into play. Take a large, flexible portion of that leave and put it into the jar. Pack it down really well and tuck the edges in around the chopped cabbage. This will help to serve as a cap and ensure little pieces of kraut don’t float to the surface where they can become infected. Next, place some type of weight on the leaf. You can use almost anything here. The things I’ve used include a clean stone, a narrow olive jar filled with pebbles, and purpose-built sauerkraut weights. You’re limited only by your imagination - as long as it will fit in the jar’s mouth and keep the cabbage submerged, it’ll probably work. Once you’ve submerged and weighed down the cabbage, you’re almost there. All you have to do now is put a breathable cover on the jar. Leaving the jar open exposes it to bacteria and debris that could fall in. Your cover can literally be as simple as a paper towel held around the neck of the jar by a rubber band. Cheese cloth will also work, as will a linen napkin. Again, I’ve used all of these and they all work just fine. Now all you have to do is watch and wait. I usually let my kraut ferment for 10-14 days before pulling it. How do I know when it’s done? I taste it. the longer it goes, the strong the sauerkraut flavor will become. This can also be impacted by temperature; in warmer environments the process tends to happen a little more quickly. This is the most important part! When your kraut is good and ready, all you have to do is put in the fridge and start eating it! That’s it. I can’t give you a specific recommendation on how long it will last in the refrigerator. . .mostly because mine doesn’t last very long. Ky and I eat ours plain, on sandwiches, or cooked over a pot of brats.